Case making is no easy feat! Being a silver-smith is one of the nobler pursuits (in my opinion). 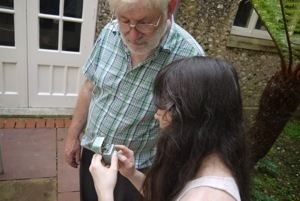 John Norgate, my mentor and silver-smith extraordinaire, is one of the most spectacular people I have ever met (but I am probably biased). From the way he shuffles about to the way he always says “Ta!” as an exclamation of thanks. I am endlessly grateful for his insight and encouragement throughout the making of the silver case. I started out with .80mm silver sheet. 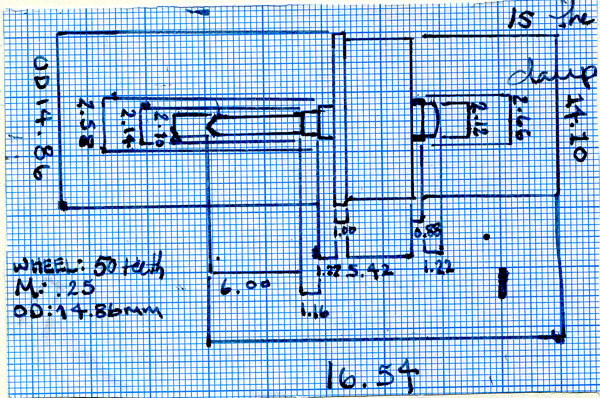 The task was to transform this sheet into a case that would fit the automaton ship. Because the mechanism for the ship is an odd shape and as a conservator, modifying the mechanism in any way to fit the case is unacceptable, the case needed a very specific design. I decided to use existing screw holes in the mechanism plates and make a steel former that could be used to shape the silver sheet. 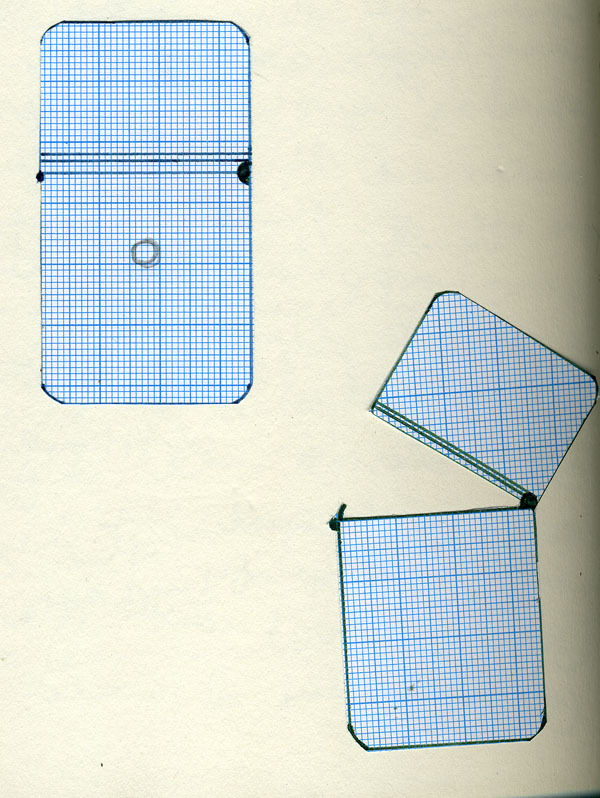 I based the shape of the case around other cases of the 19th century. As this is the only known object of this type, the case could not be based off of other examples. 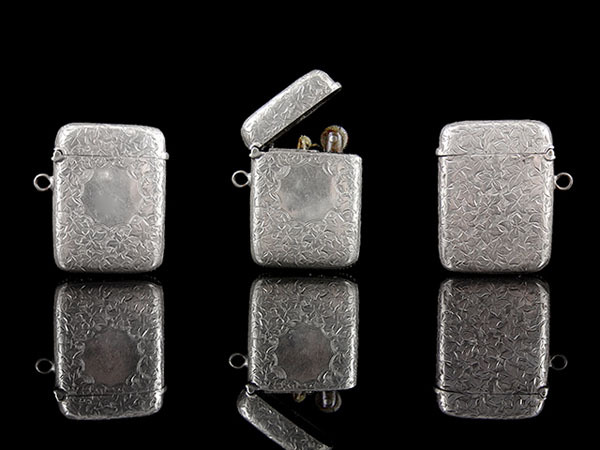 I looked at small silver cases for the pocket. 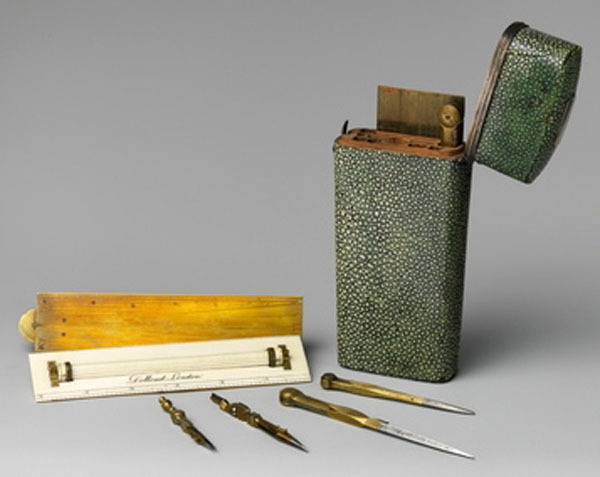 Many of these were covered in shagreen, a material historically used to cover portable compass sets , spectacle cases, and other objects carried by in the pocket. 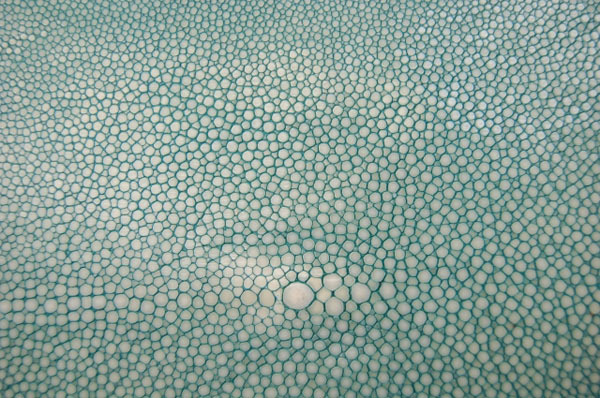 Shagreen is amazingly durable, being made from ray skin, and has been used in a variety of applications, from furniture to decorative objects. 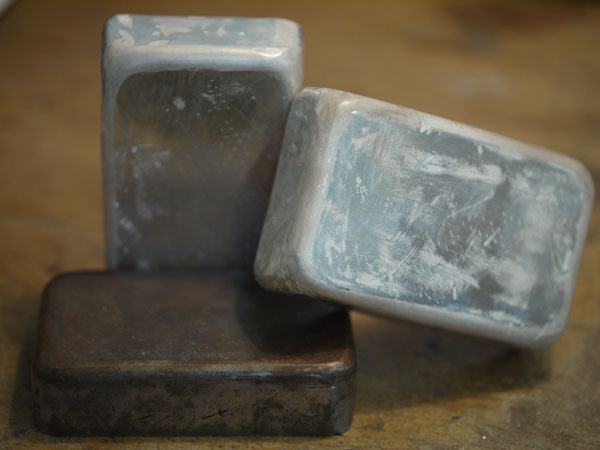 Once I had annealed the silver several times and hammered it into shape, I had two cushioned shaped pieces of silver. These I soldered together and then cut what would be the lid. I made the bezel for the mechanism in the bottom half of the case and soldered the pieces into place. After which, the aperture for the ship and scenery was soldered to the inside of the lid. The next step was the reeded wire. 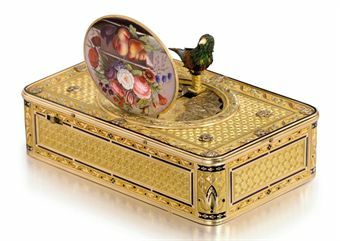 Cases of this period sometimes had a reeded wire that followed the lid of the case and joined the hinge at the back, making the hinge invisible. While this seemed ambitious, I am always committed to quality and love a good challenge. 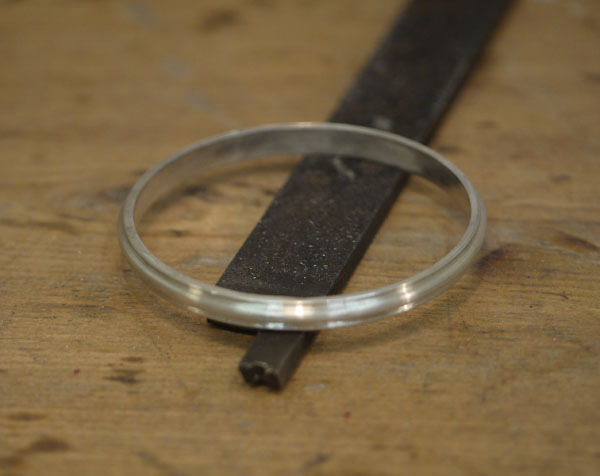 I took a strip of silver and hammered it into a circular shape, and then soldered the two ends together. This was put on a box wood former and turned on the lathe with a modified file. Taking an old file, I annealed it, filed out the profile I wanted the wire to have, hardened it again and used it as a graver to cut the silver down. I then soldered the wire in place. 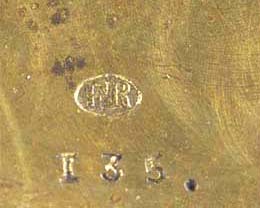 Following this I made the hinge from silver tube, drawn down with candle wax and a brass pin, to the appropriate diameter. 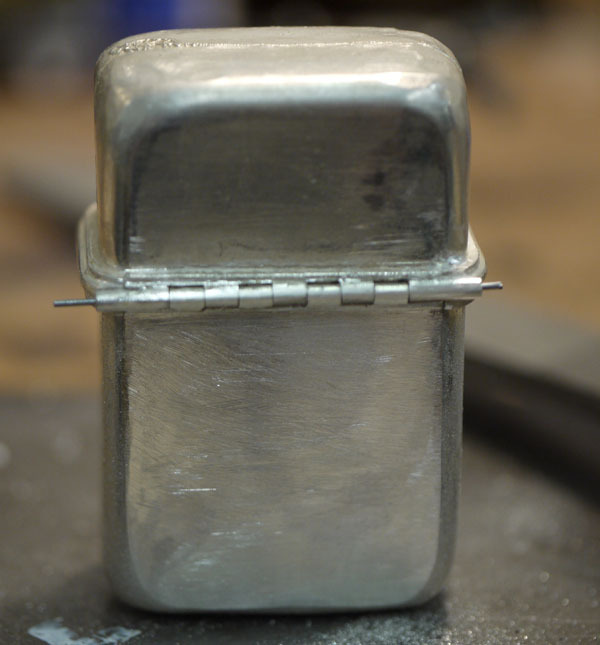 These were cut into knuckles and soldered on both the top and bottom part of the case and onto the reeded wire. 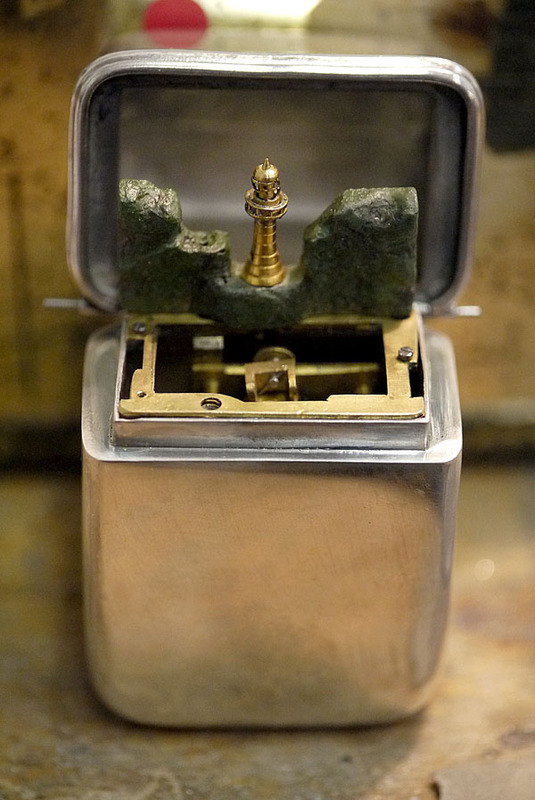 Many hours were then spent on cleaning, polishing, and finishing both the inside and outside of the case. The real challenge now came. I needed to drill blind holes in the case for the winding bezel and start stop buttons. I won’t reveal how I ended up doing this part, but I will say it included lots of double sided tape! I took the case to the books department at West Dean College and approached my friend and talented colleague Abigail Uhteg. I asked if she wanted to collaborate on the covering of the case. I researched some shagreen distributors in London and chose an appropriate color for covering the case. Abby took it from there. 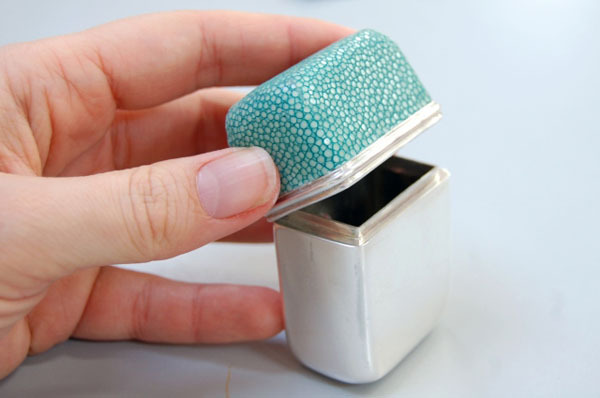 I won’t reveal her secrets, but she does a fantastic job of leading you through the process of how she covered the case in her post Shagreen Covering for a Silver Case. Once the case was covered I added the winding bezel and start stop button and a hinge safety lock. The winding bezel and safety lock were made to mirror the style of the readed wire. I then finished the case with the addition of some beautifully faded 19th century blue silk provided by the owner. 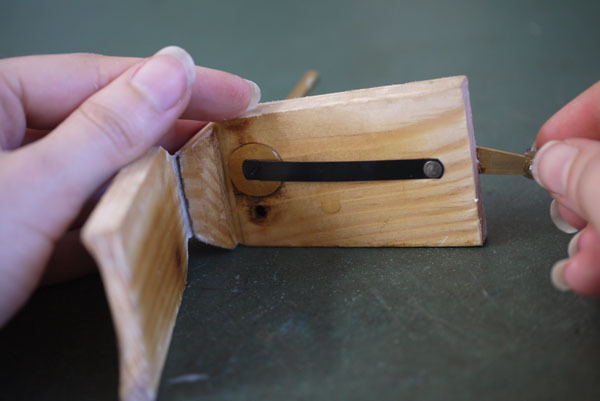 In went the completed ship and mechanism – and voila! My favorite restoration object came to me in a small metal tobacco tin as a broken mechanism with the promise of great reward. It’s small – about 3 cm across by 4 cm high and 2 cm deep. 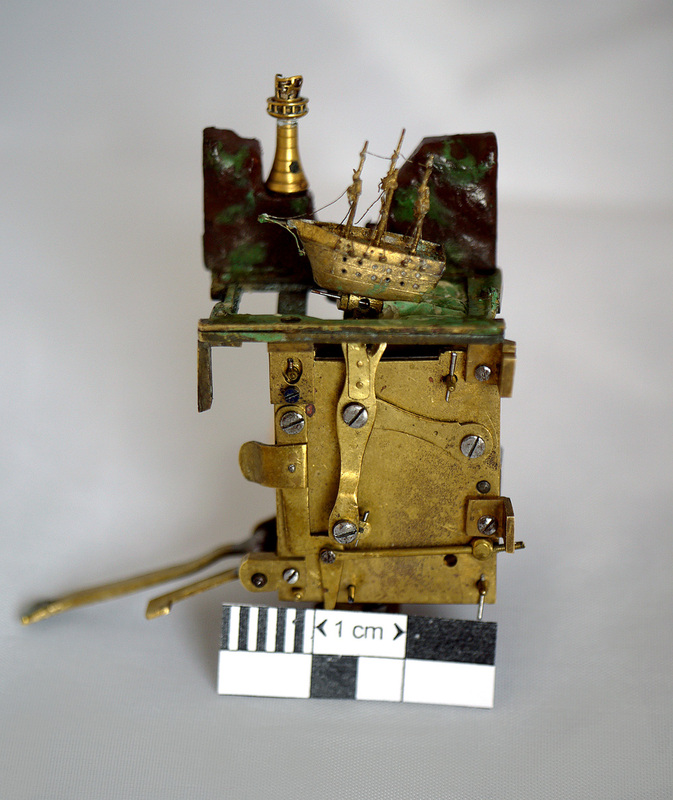 It’s known as the fairy ship – a miniature ship automaton that plays “God Save the King”. 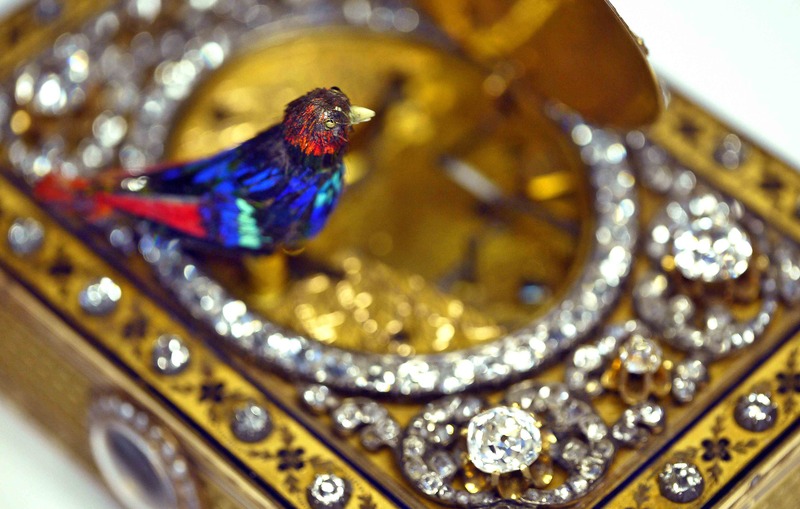 With a background as jeweller and watchmaker, I felt confident that I was the right person for the job! The challenges at first seemed daunting, but rising to meet them made me a better conservator and strengthened my patience and reserve ten fold. I have posted and published on this piece before. 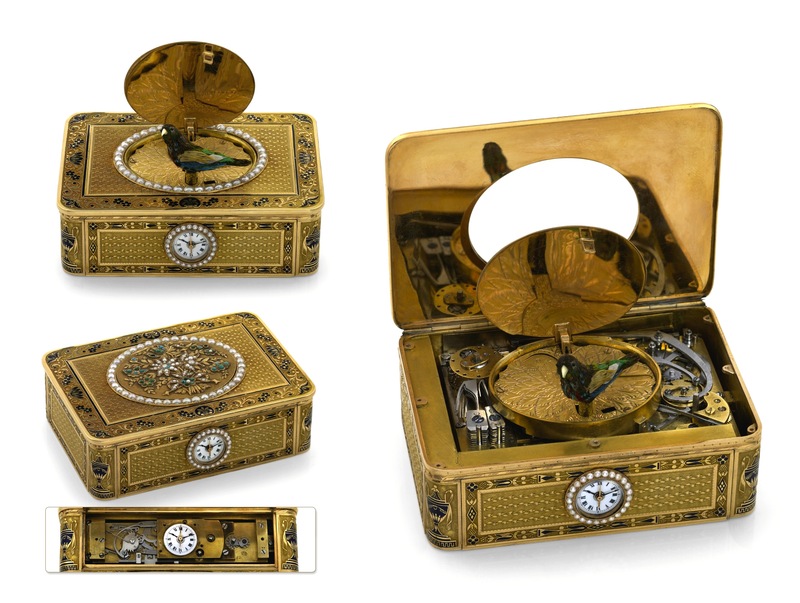 You can find the article in the AHS (Antiquarian Horological Society Journal) here and the West Dean blog post here, but I thought the piece deserved a bit more explanation. I will elaborate on bits and pieces of the process in a post from time to time. 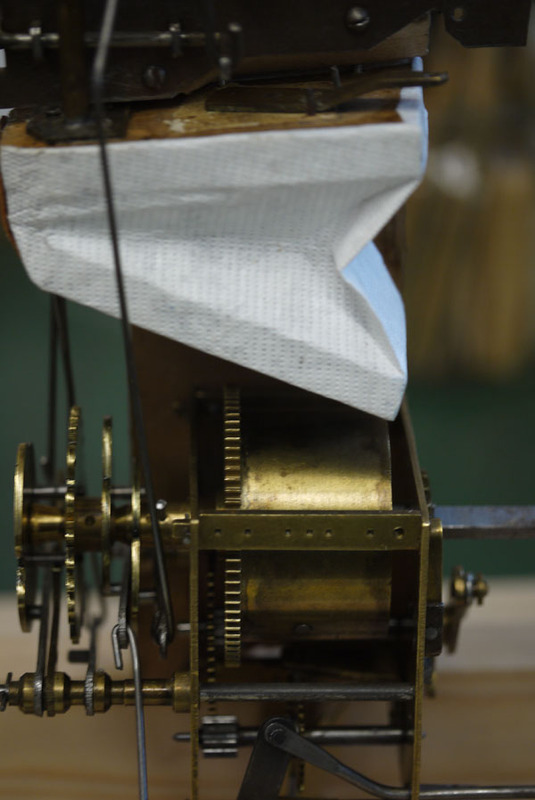 Restoring the mechanism to working order required hours of problem solving – and a lot of solitary pondering in the West Dean workshops late into the night. 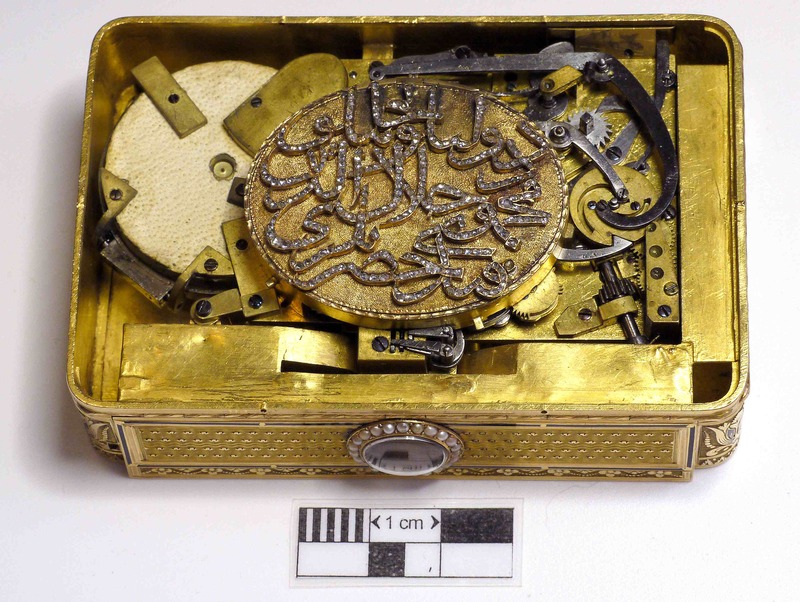 The object has an early type of music mechanism. 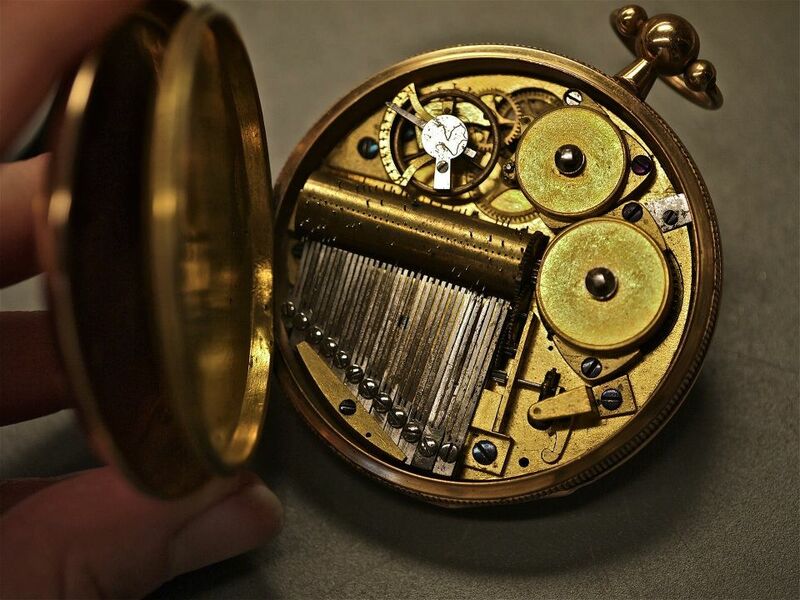 These were short lived – as they didn’t work very well – and were replaced by the flat disc mechanism and miniature pinned cylinders found in pocket watches. 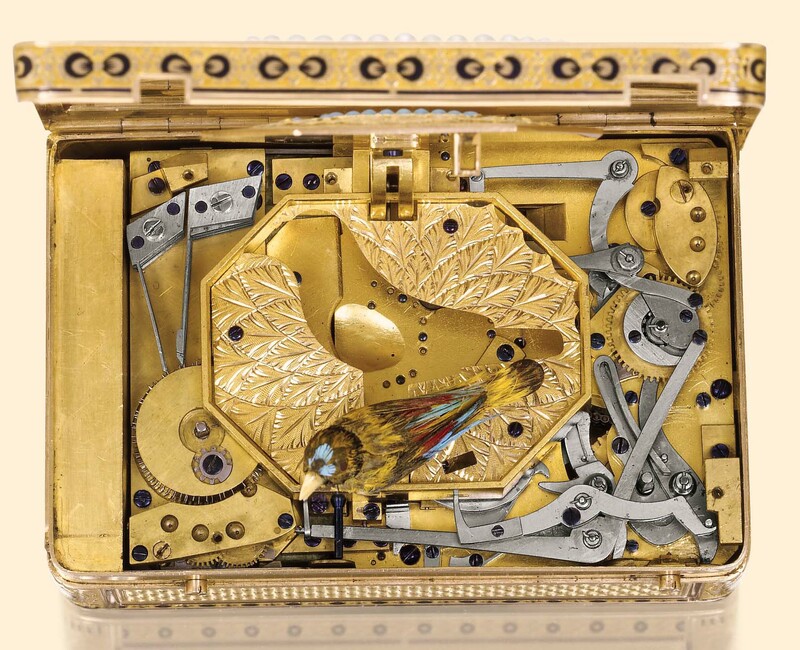 As the music mechanism used in the fairy ship is very rare, I had not encountered a similar one before. A couple of the comb teeth offered a feeble note at best when plucked by hand and the pinned music barrel didn’t coax a note from the comb at all. where do I start? the bearings in the barrel body and cap are both worn – making the barrel run out of true – so both bearings need bushing. The mainspring is slipping inside the barrel. 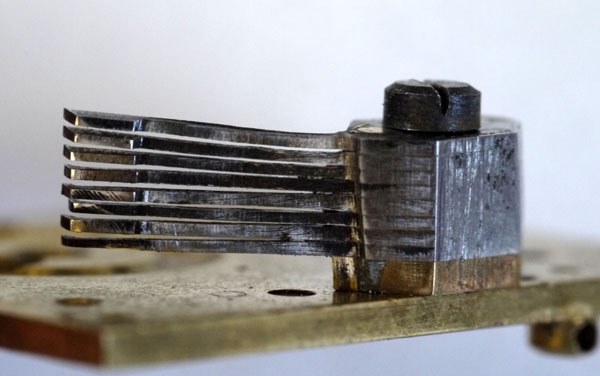 The pins on the comb are all rounded and worn down. The comb doesn’t sit flat, but at an angle. The teeth of the comb are all different lengths and shapes and sit at different angles….and on and on and on…. I finally decided to resolve each of these in turn and go on from there, but these were just a fraction of the problems in need of resolution. The scenery and the ship were in a state and I needed to make a case from scratch. 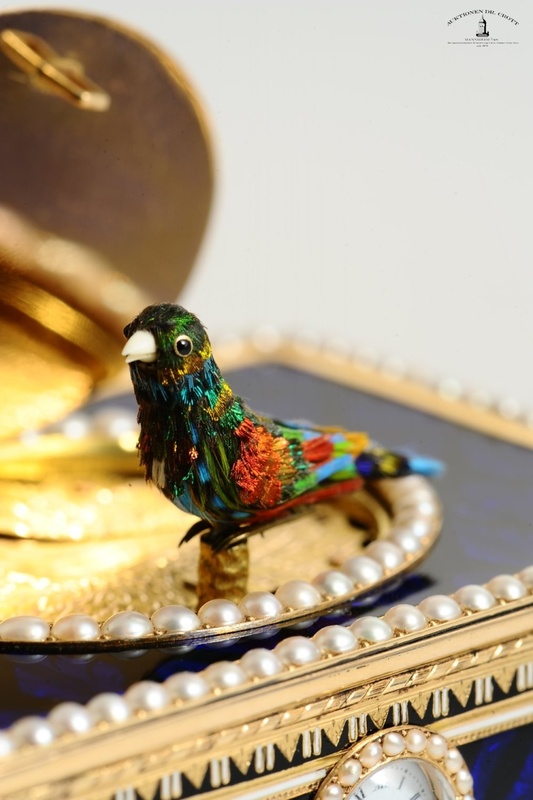 My previous experience with case making included a single hinged gilt box fabricated from gilding metal. 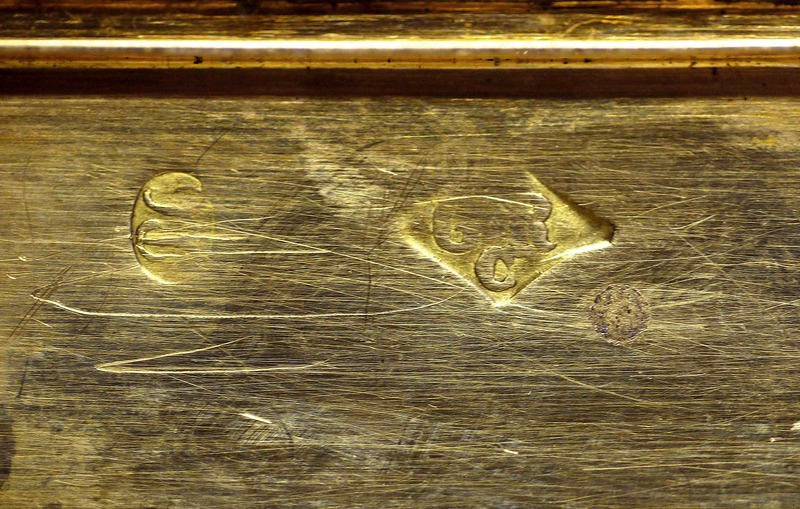 Gilding metal is really difficult to work with – it sticks to files and eats saw blades by the dozen. A bit of bees wax on the blade can reduce casualties – but plan on starting with a full pack and ending up with half when all is said and done when working with gilding metal. Starting with the mechanism I made a duplicate music barrel with pins varying in height, angle, and shape in order to investigate possible resolutions for the problems in the original barrel. I found that the shape and height of the pins made the greatest difference to resonance of the comb. 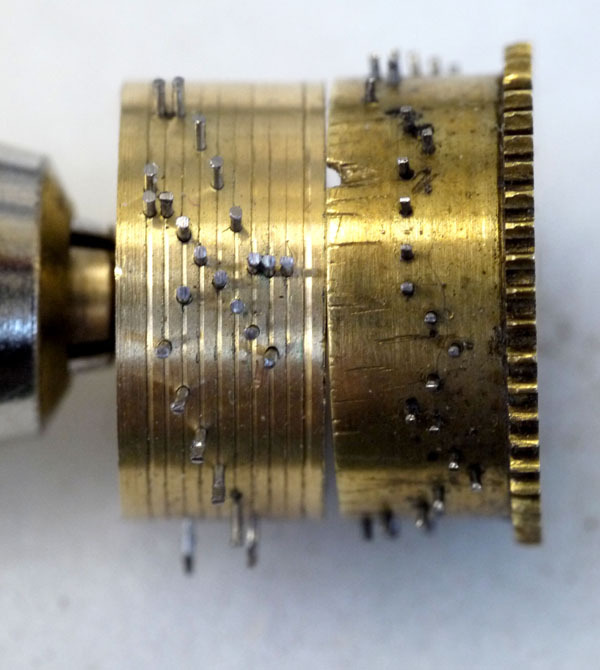 Once the best pin shape and height had been identified, I altered all the present pins on the original barrel until they produced a sound on the comb. 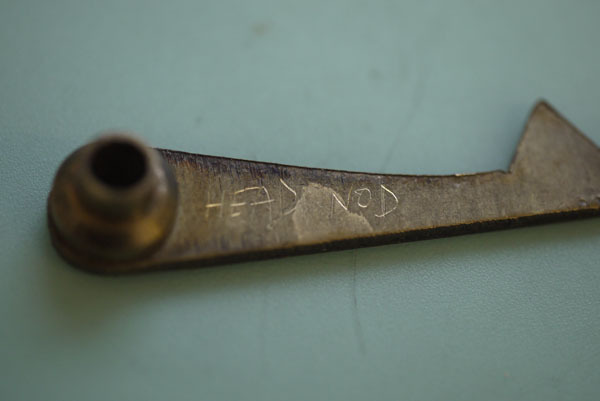 The replacement of a missing pin put the barrel back into operation after resolving the other aforementioned issues. I will go into the construction of the silver case in a subsequent post, but for now I’m off to my local co-op to get some groceries for dinner. My sister recently relocated to Seattle and is making kale and potato enchiladas! 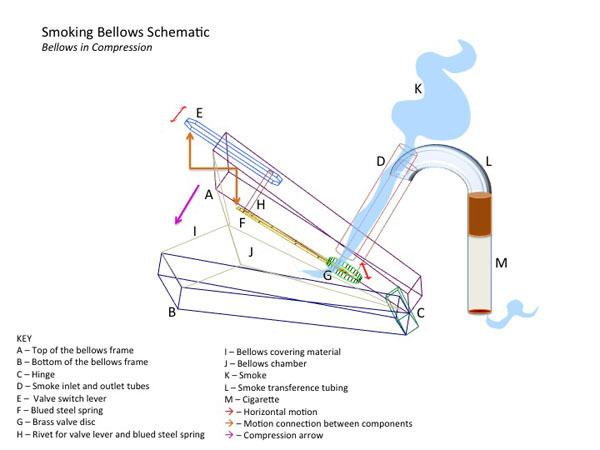 The mechanism of the Smoker is rather simple. The train is driven by a single spring driven barrel. Attached to the barrel is a series of cams that control the motions of the Smoker – the movement of the head, the opening and closing of the mouth, and the lifting of the hands. The barrel also drives an intermediate wheel and fly – controlling the speed of the motions, the blinking of the eyes, and the inhalation and exhalation of the smoke into the bellows. The largest problem with smoking automata, are the problems that arise with the bellows system and not so much with the mechanism. 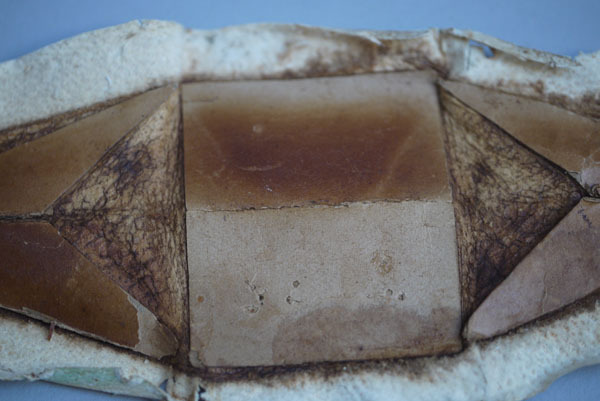 The bellows coverings are the first thing to break down, as they are made of organic materials that are directly in contact with cigarette smoke – a highly toxic and corrosive substance. 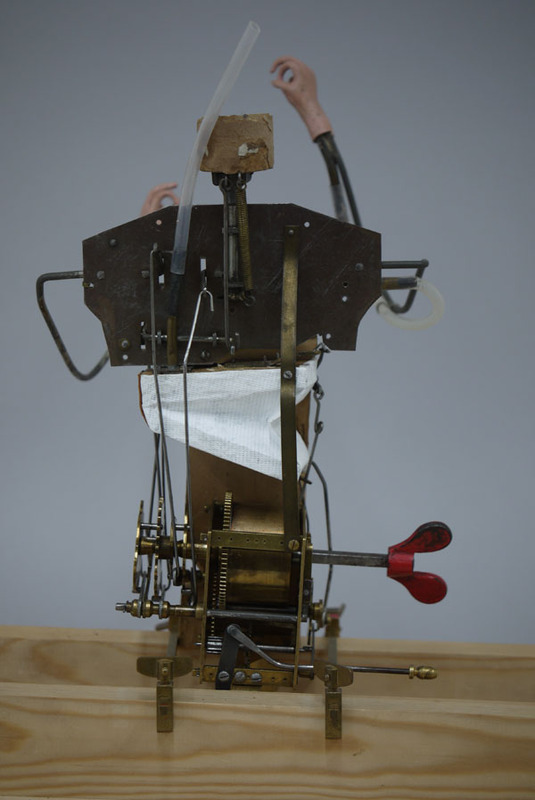 This is a serious issue for this type of automaton as every time the bellows system needs repair, the figure must be undressed and the paper mache body opened. 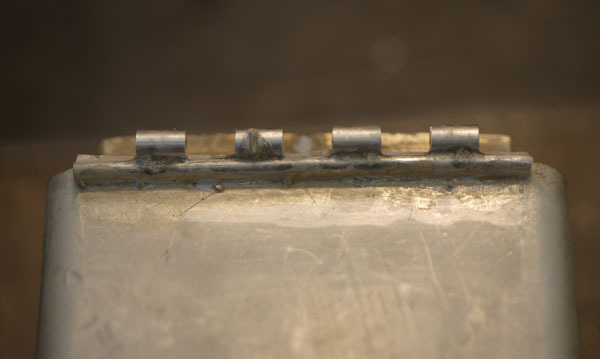 Collateral damage to these materials is inevitable when the mechanism is in need of repair. This was the focus of my MA studies. I wanted to identify a modern material that could stand up to long term exposure to smoke and its effects, while still serving the functions of a bellows covering material. The functions of the bellows valve system must be checked for proper action before the bellows frame is recovered. 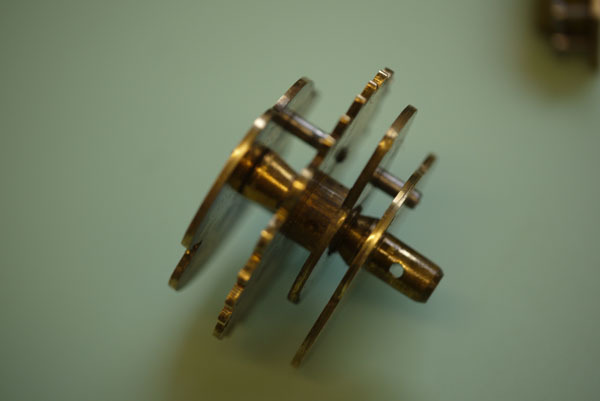 The valve lever rivet must be free enough on the frame to allow the blued steel spring to move the brass valve disc from the inhalation to the exhalation pipe, but be tight enough to keep the disc in tension against the frame so it doesn’t drop off. After preliminary tests were carried out for my MA, I recovered the bellows with Tyvek coated in a pH neutral acrylic medium to ensure airtightness. I talk about recovering bellows here. This material proved to be the most reliable and stable over time. 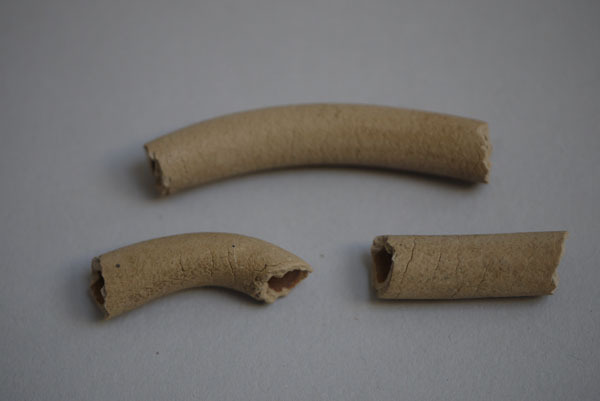 The tubing for the smoke transference was replaced with a material used in the medical industry, as the original tubing of volcanized rubber had severely degraded, becoming brittle and fractured. After the bellows system was restored, all the proper checks were carried out, and the mechanism was overhauled the Smoker was ready for its first cigarette in a long time. 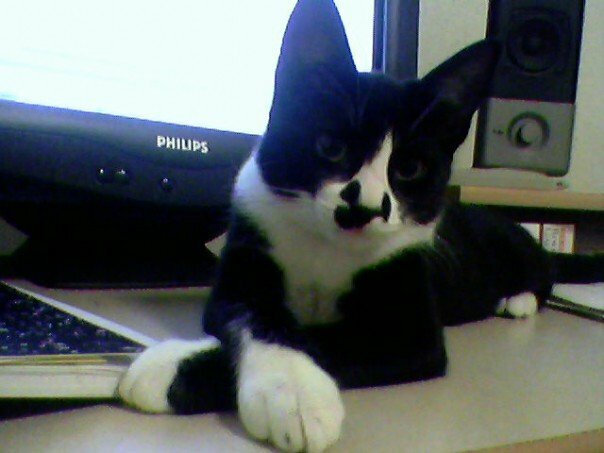 You will be invited to join him in a subsequent post. 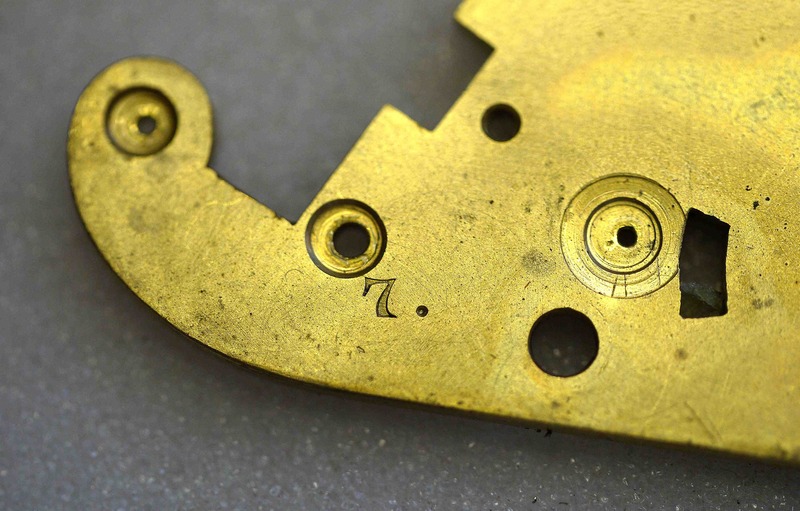 *not in all cases – for example a carriage clock where the plates are visible and are beautifully bright, but are etched with a dark fingerprint – this is something that would require consideration and likely removal.